Happy Holidays: Forget your Easter bonnet, put on your dancing shoes! Forget your Easter bonnet, put on your dancing shoes! Years ago I worked at store called "Fox And Fluevog Boots and Shoes" making clogs and sandals. The Edwardian store interiors were amazing. The Victoria store was the best of the four shops that they owned. The three other stores were in Vancouver, Canada. Peter Fox one of the owners who designed the shoes also did the interiors and he was the most satisfied with the Victoria shop. The interior was an Edwardian library two stories high with floor to ceiling books on two walls. The books were bought at second hand stores by the box load. Those stores are now gone but the two owners Peter Fox and John Fluevog opened their own stores. Peter Fox opened "Peter Fox Shoes" in Soho in New York in 1981. The store was closed in 2007 and "Peter Fox Shoes" became an e-commerce store. Peter Fox retired in 2008 and passed the store on to his long time store manager, Helga Magi. John Fluevog opened "John Fluevog Boots and Shoes" in Vancouver and now has ten stores - 4 in Canada and 6 in the US, as well as a website "John Fluevog Boots and Shoes". Ken Rice, the fellow that I worked for making clogs and sandals, opened up "Ken Rice Shoe Studio" in Vancouver, BC. He also has a website "Ken Rice Shoe Studio". All of this trip down memory lane is an introduction to my new candy container ornaments for Spring. I am working on my EHAG Emporium piece for the end of the month but I wanted to show you these 5 new shoes. After my EHAG Emporium piece is finished I will have close-up pictures and detailed descriptions of each shoe on my sales blog. If you can not wait and want to buy one or more of the shoes now e-mail me at info@happyholidays.ca. Each shoe is $55.00 U.S. plus shipping and handling. Starting at the bottom the first shoe is - "Spring Time". There is a hand-made branch of vintage blossoms and leaves with a birds nest tucked under the leaves. Two eggs are in the hand-made nest. Available in my Etsy shop. The "Blue Skies and Flowers" shoe has a pale pink bouquet of vintage leaves and flowers on the front of the shoe. Available in my Etsy shop. The two shoes on the top step are the yellow shoe "Candy" and the red shoe "Victoria". "Candy" is decorated with vintage leaves and flowers as well as vintage trims. The "red candy sugar heart" is handmade. "Victoria" has a hand-made bouquet vintage leaves and flowers. "Candy Says I Love You" is available in my Etsy shop. "Red and Yellow Victoria Shoe" is available in my Etsy shop. 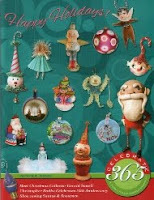 The shoe candy container ornaments can be used in place of an Easter basket for that special someone, as a birthday, wedding or Easter gift; they would also look great on a Christmas tree. In case you might be wondering, I shot this photo of the shoes on our kitchen table. All of the grass and flowers are fake. I love artificial plants. The marble steps are real! 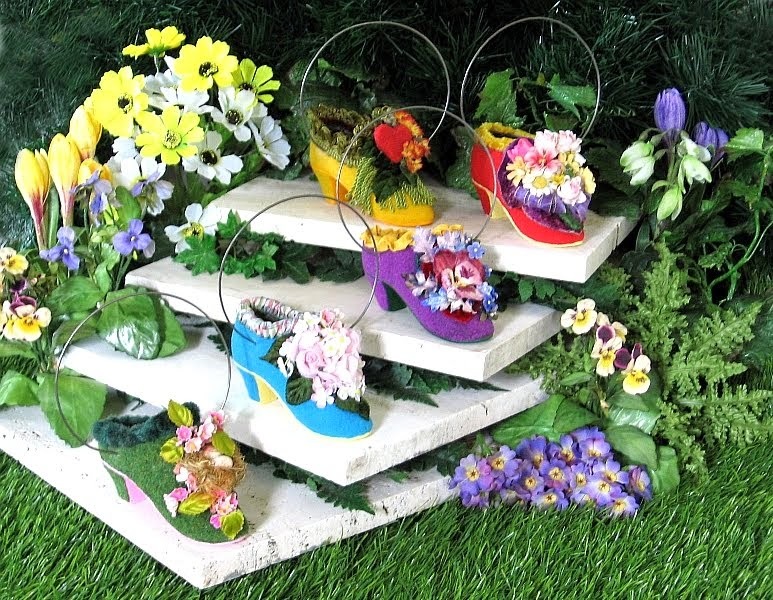 Lovely & festive Easter shoes! Happy 1st day of Spring Len! Thank-you and Happy First Day of Spring to You as well! This site sounds amazing and appeals to the shoe addict in me. This site is indeed a value adding one。I was thinking about writing a post on this exact subject. Thank you. The EHAG Emporium and Hot Cross Buns!